An extremely noteworthy and negative event took place in early October, largely unreported by the corporate-controlled media: in a coordinated purge, Facebook and Twitter deactivated the accounts of hundreds of independent media pages, some of them with hundreds of thousands or even millions of followers, just a few weeks prior to a major election. Articles describing this coordinated purge of accounts can be found here, here, and here. Lee Camp and Eleanor Goldfield’s overly profanity-laden but still substantive discussion of this important topic can be heard (or downloaded) here. The fact that the personal Twitter accounts of some of the individuals associated with the pages that were purged from Facebook were simultaneously suspended for no specific reason (such as the Twitter account of Anti-Media editor Carey Wedler, discussed here) is a particularly ominous development and demonstrates that last week’s deletion of accounts was coordinated across two major platforms for publication and political expression. This opinion is so widespread that it is raised as a possible counter-argument by both Carey Wedler in her video linked above and in the podcast by Lee Camp and Eleanor Goldfield, although in both cases they argue that the “private companies can do whatever they want” assertion is invalid. Carey, Lee and Eleanor are correct: the argument that private companies such as Facebook and Twitter can do whatever they want is invalid, although the counter-arguments offered in the video and podcast linked above are somewhat tentative. 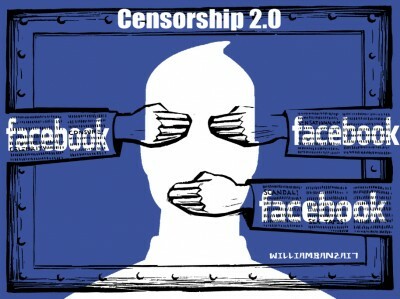 It should be blatantly obvious that this coordinated act of political censorship is morally reprehensible and in fact patently illegal — notwithstanding the fact that both Facebook and Twitter are private corporations. However, many in the “alternative” community are somewhat conflicted on this issue, because of the widespread adoption of the seductive but badly mistaken ideology of libertarianism, which believes there is little that cannot and should not be privatized, and rejects the idea that the government of the people should act as a counterbalance against the privatization of that which properly belongs to the public itself. As Professor Michael Hudson says in this regard, “Libertarianism thus serves as a handmaiden to oligarchy as opposed to democracy” (see full quotation on page 142 of his essential text, J is for Junk Economics, which is quoted in previous posts such as this one and this one). Note that this interview was recorded in 2004, the very year that Facebook was initially launched and long before Facebook was the media giant that it has since grown to become. Indeed, Facebook was not even opened up to the general public until 2006 — and the very first generation of the iPhone (which would radically transform internet use and the power of social media sites such as Facebook and Twitter) was not even launched until 2007. Twitter was not created until 2006 either. The government, which in a democracy or a democratic republic should represent the people, has a vested interest in preserving the public domain for the use of all of the people. However, as Professor Hudson explains in that interview, the government failed to perform that duty during the first half of the twentieth century, and auctioned off the spectrum (the “airwaves”) at fire-sale prices to be privatized, primarily to those with inside connections. And, as those who have read Yasha Levine‘s outstanding 2018 book Surveillance Valley: The Secret Military History of the Internet, the exact same pattern has been followed with the internet itself. In Professor Hudson’s 2004 interview, linked above, he explains that this pattern of giving away the public domain mirrors the giveaway of public land to the railroads during the nineteenth century (and created the same kind of multi-billion dollar wealth for those who benefit from these giveaways). Professor Hudson notes that the electromagnetic spectrum is technically not “owned” by the tech and telecom companies who license that spectrum from the government, but that they are paying 1920s prices for that spectrum, and that the government does not charge taxes anywhere near appropriate to the value of the public resource (the spectrum) that they are essentially giving away. The classical economists of the eighteenth and nineteenth centuries, as Professor Hudson explains in J is for Junk Economics and in his other books, articles, and interviews, saw the gifts of nature (including “land, water, mineral rights, airwaves” etc, as he writes on page 60) as belonging to the public, and that these gifts were “best administered in society’s long-term interest via government or a community, not monopolized by rentiers as the ultimate takeover objective of finance capital,” which is exactly what has taken place in so many areas of society today under neoliberalism (accelerating, as Professor Hudson points out, after 1980). Thus, the electromagnetic spectrum is a gift of Nature (or of the gods), just as are the air we breathe, the water in the streams and rivers and lakes, the growing power of the soil to produce crops and trees and lumber, the mineral wealth under the soil, the ports and harbors along the coastline, and indeed even the rays of sunlight which give life to every living creature and growing thing on our planet. It does not belong to Facebook. It does not belong to Google. It does not belong to Twitter. It does not belong to Amazon. It is a gift of Nature (or the gods) to all the people of the land, just as are the rivers and mountains and forests and the air we breathe. The government — which represents the people, according to the founding documents of this nation — does not just have a right to administer that electromagnetic spectrum in society’s long-term interest: it has an absolute duty to do so. Facebook and Twitter, it should be pointed out, would not have much of a business without access to the electromagnetic spectrum over which their websites are broadcast — and they are using that electromagnetic spectrum at the pleasure of the people, whose will is supposed to be represented by the government of the people, in a democracy or democratic republic such as that envisioned by the founding documents of this country. Obviously, the government can be captured by corrupt forces of cronyism who give away what rightfully belongs to the people (and which by rights cannot be given away to be privatized for the benefit of just a few) — and this exact form of cronyism and the pattern of giving away of the public domain to a few well-connected insiders has played itself out over and over in our nation’s history (including in the examples cited by Professor Hudson in the above-linked interview). However, the solution for that cronyism is for the people to wake up, and exercise their right to demand that such illegal giveaways be reversed. And, in the case of corporations who are using the public platforms they have built on top of what is, in fact, the public domain to abridge the freedom of speech, and the press, and the right of the people “peaceably to assemble,” the people must demand that their representative government put an immediate stop to such illegal behavior by those companies — which in this case includes Facebook and Twitter. The supreme law of the land, enshrined in the Constitution, acknowledges that the freedom of speech, and of the press, and of the right to peaceably assemble are inalienable rights. Those rights are now being threatened, as a result of the egregious and lamentable giveaway of the public domain (discussed at greater length in the Michael Hudson interview) and the abject failure of the elected government (over the course of the past 100 years) to properly administer that public domain in the best interest of society and the people at large. Because of that privatization, and that abdication, companies such as Facebook and Twitter have in large part become the public forum for the expression of ideas and political opinions. They must not be allowed to abridge the right of the people to peaceably assemble, or to express their ideas in a peaceable manner in the public forum. I would argue that this struggle goes all the way back to the destruction of the ancient wisdom that was given to all societies on earth in remote antiquity. The ancients understood that the gifts of flowing fresh water, or of the produce of the harvest, came from the invisible realm — the realm of the gods. The story in Greek myth of the giving of the olive tree to the people of Athens, by the goddess Athena, is a good example which illustrates this principle. Staying with ancient Greece, they likewise understood the bounty of the harvest to be a gift from the goddess Demeter, and the riches of mineral wealth locked away beneath the soil to be given by the god of the Underworld. If we had to identify the god with whom the bounty of the electromagnetic spectrum would have been understood to be associated, it would most likely be Zeus himself (see image above). The advent of literalist Christianity, and especially the series of events which led to its installation across the Roman Empire, led directly to the overturning of this understanding in the territories over which Rome exercised power — and eventually to centuries of feudalism, during which the gifts of the gods to all the people were usurped for a small, well-connected segment of the population. The classical economists, with their focus on taxing rentier privilege and natural monopolies, wanted to undo the oppressive structures that characterized the feudal system — and they were making significant progress in that direction throughout the eighteenth and nineteenth centuries, before the rentiers struck back. But the cause of these rentiers and privatizers is ultimately doomed, because they do not have a leg to stand on. Their cause is not merely unjust — it goes against the law of the universe itself. That which properly belongs to the gods, and which is given by the gods to the people of the land, cannot ever really be sold-off, or given away. It does not belong to the privatizers, who cannot claim to own the rivers, lakes, forests, aquifers, oil reserves, fresh air, or electromagnetic spectrum, any more than they can claim to own the sun itself. To claim otherwise is to go against the deathless gods themselves — and that path is always shown to be a path of folly and of ultimate destruction, in the timeless wisdom of the ancient myths, scriptures and sacred stories given to the ancestors of every man and woman on this planet. David W. Mathisen is the author of eight books about the connections of the world’s ancient myths to the stars. His website can be found at www.starmythworld.com.